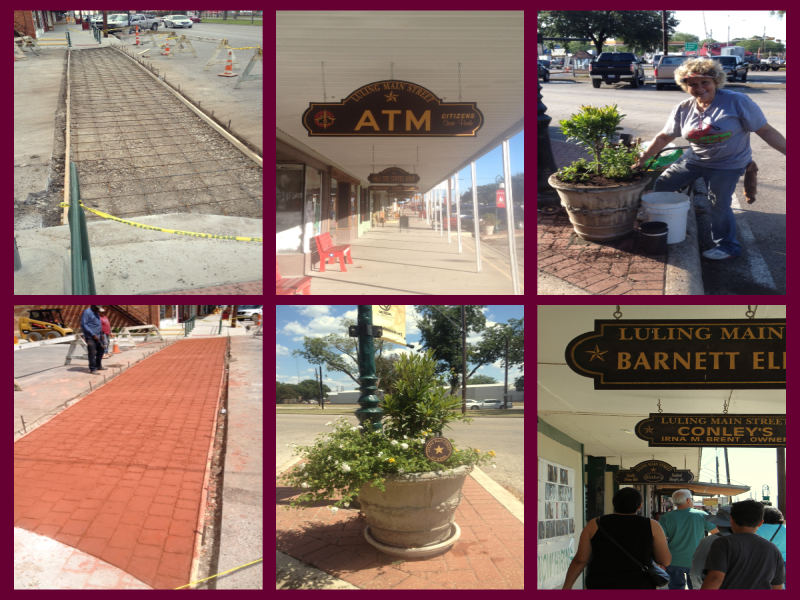 Luling Main Street has tackled several projects over the years to improve function and aesthetics in the downtown area. Here is a sampling of some of the projects we have commissioned and completed. This project recognizes several people from Luling that have done exceptional things on the national level and give our community a platform to highlight their accomplishments. When tourists make their way through our “Heritage Circle” and say “oh yeah, I remember him… I didn’t know he was from Luling…” That is the payoff. With the increasing amount of out of town visitors we are now seeing, we thought it would be good idea to tie these great accomplishments to the heritage of Luling in a way that would be meaningful to everyone who sees it. 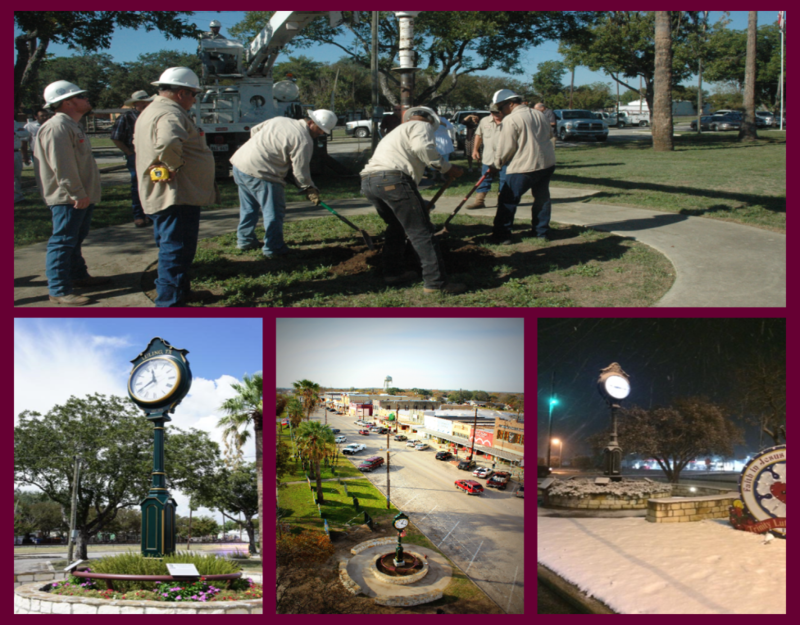 Heritage Circle features a downtown seating area that surrounds a 17 ft. tall, 2-sided pole clock. The clock face itself is 3 feet in diameter, and is back-lit at night. The clock says “Luling, TX – Est. 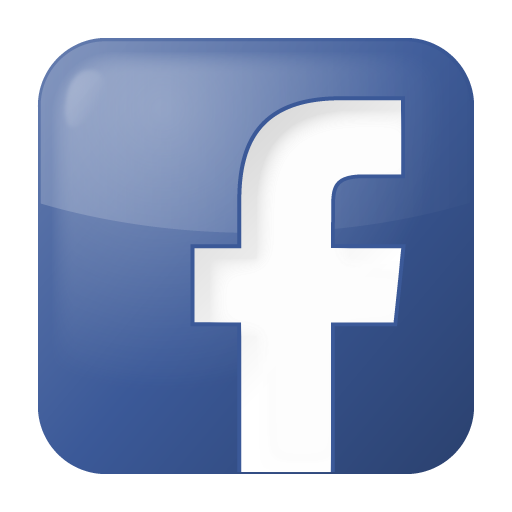 1874” across the top of it and is the obvious centerpiece of the project. The clock is located downtown on the southwest corner of Laurel and Davis and the clock is surrounded by a circle of stone benches and landscaping. 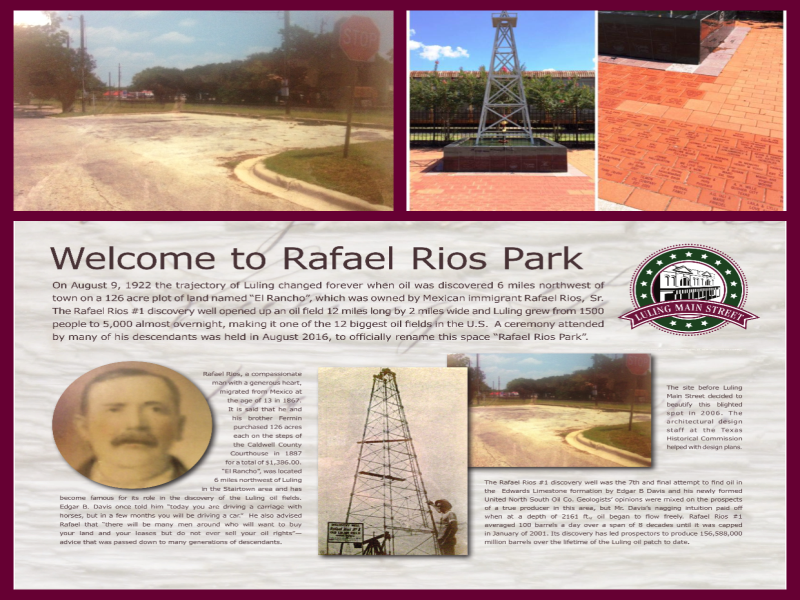 On August 9, 1922 the trajectory of Luling changed forever when oil was discovered 6 miles northwest of town on a 126 acre plot of land named “El Rancho”, which was owned by Mexican immigrant Rafael Rios, Sr. The Rafael Rios #1 discovery well opened up an oil field 12 miles long by 2 miles wide and Luling grew from 1500 people to 5,000 almost overnight, making it one of the 12 biggest oil fields in the U.S. When the Pecan St. railroad crossing was closed many years ago it left behind an unsightly void in the downtown area. In 2006 Luling Main Street created a pocket park to help beautify the area while highlighting the discovery well for the Luling oilfields. A ceremony attended by many of his descendants was held in August 2016, to officially rename this space “Rafael Rios Park." 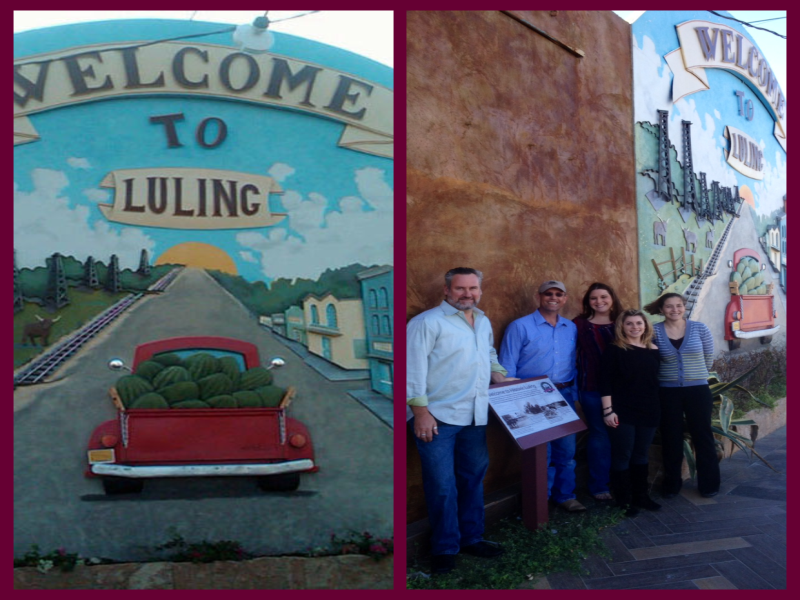 Luling Main Street commissioned the Mural in 2011, and later added the informational plaque to tell the story about how the Mural Project started, and to highlight each of the important aspects that Luling is known for. It tells the story of Luling’s origins which can be traced back to the railroad terminus that was completed here in 1874, as well as the story about how Luling became a preferred shipping hub for Black Diamond watermelons due to the ideal soil types of the area and due to easy access to the railroad. It also mentions Luling’s rich oil history and the resulting boom times when oil was discovered by Edgar B. Davis just a few miles northwest of town back in 1922. Funds raised from our 1st Annual Rajun’ Cajun Throwdown in March of 2011 paid for the Mural’s construction later that year by mixed media artist Josh Farrel from Luling.